How would you feel being able to make an unforgettable vintage road trip through the mesmerizing Malta landscapes this summer? Well, no worries; you can! 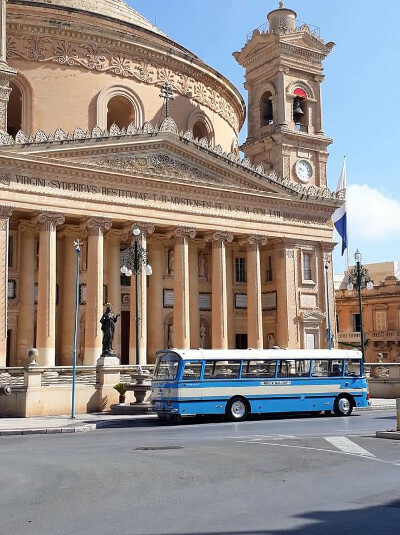 Malta Bus Coop Ltd. offers cultural heritage buses for rental opportunities. 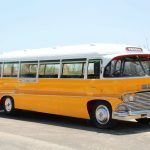 These buses bring you the nostalgic 60’s – 70’s look and surely will give you that old Maltese vintage feeling and will complete your Malta experience to the fullest. This six-year-long project has eventually led to a fleet of no less than 21 iconic buses. Please visit our website to see a full overview of all the buses that are a part of our extensive offer of authentic buses from the past. Located in the south of Europe, Malta is known for his pleasant climate and friendly people. Next, Malta is one of the smallest, but also one of the most densely populated countries in the world. The longest distance on Malta is only 27 km, but it will surely offer you the most breath taken sights you can possibly imagine. Malta Bus Coop is in possession of a very impressive fleet of buses. With a big variety of buses built from 1931 to 1979, this can be considered as a very precious collection of authentic buses. Most of them have been restored in the last few years, but their original chassis is still in use after all these decades that have past. If you want to taste the traditional delicacies of Malta local farmers. This is the perfect tour for you. This particular tour will have a visit to an eco-farm as well. Furthermore, you will be able to have a look at the farm’s kitchen and witness how fresh products will be turned into tasty delicacies. This tour will guide you to the main attractions and the most ancient and mystical place of Malta. The tour will start going to Mosta; visiting the famous Rotunda Church’s dome. Followed by the iconic village of Ta’Qali Craft’s village. The medieval town; Mdina (former capital of Malta) will be the ending destination. Malta is well-known for his many festivities (also known as festi). In the summertime, almost every week several festi will be organized. The tour will let you experience some of the most thrilling festivities including with some great fireworks in the end. The capital city of Malta; Valletta, will be the first destination during this tour. Next, the ‘Three Cities’: Vittoriosa, Senglea & Cospicua will be visited. A tour full of great architectural charm and historical greatness. if you think Malta is already gorgeous during the day, then be prepared to see Malta by night. There’s nothing like a beautiful sunset after a bright day. It will surely take your breath away and makes you see Malta from another perspective. This tour will let you discover the well known ‘Blue Grotto’ (Grotto Azzura in Maltese). Be prepared to witness some mesmerizing clear waters and some of the most iconic places of the island. Also extremely popular for diving and snorkeling enthusiasts. A full day of visiting some of the greatest traditional hotspots of the island. You will definitely not forget an excursion like this. Next to visiting Blue Grotto, also the Dingli Cliffs, Rabat & Mdina will be on the route. This tour will give you a great feeling of all what Malta has to offer. As all tourists are divided throughout several places on the island. Malta Bus Coop offers several pick-up locations. There is most likely always a pick-up location nearby to your place of stay on Malta. 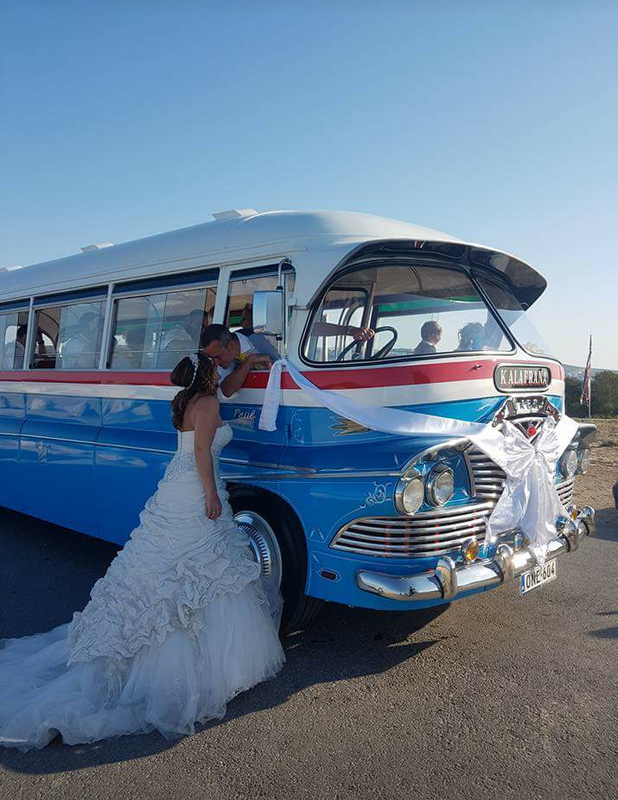 The traditional Maltese buses are also available for weddings or photo shoots. Imagine having all your family and friends being able to visit your wedding in one of these phenomenal looking buses! Are you looking for that special transport during your most special day? Malta Bus Coop will organize everything from beginning till the end. Are you interested to have an iconic bus tour with some of the greatest vintages buses out there? Then look no further and book a preferred tour that you like the most with Malta Bus Coop. For more information about these services or any inquiries for booking a tour, please fill in our contact form or give us a call any time you like. Malta Bus Coop will be glad to help you. You can visit us on the following address: Triq I-Gholjiet in Mellieha. We are available during working hours by phone as well (+356) 21573900. Hope to see you soon!